The Be Safe Be Smart campaign had another successful year making Cruise Nite safe and fun for all who participated in the festivities. We want to thank task force volunteers for all their hard-work prior to the event. The following retailers in town showed their support for the awareness campaign: 56th Street Sinclair Plaza, Apple Market, Bill’s Liquor, Bill’s Liquor West, Boogaarts, Caseys’ General Store # 1735, Caseys’ General Store # 2038, Caseys’ General Store # 2711, Caseys’ General Store #3298, Family Fresh Market, Foote Convenience Plaza, Hy-Vee Food Store 1323, Kwik Stop # 15, Kwik Stop # 19, Pump and Pantry #27, Qwest Fuel, Sims’ Shop E-Z, Speedee Mart # 2767, Thirsty’s, Walgreens #03716, Jersey’s, Platte Valley Brewery, Thunderhead Brewery. The retailers listed in blue adjusted sales displays and did not sell alcohol in glass bottles for the Cruise Nite weekend. They will be recognized at a city council meeting for their dedication to the health and safety of the community. Watch for details on the upcoming meeting. 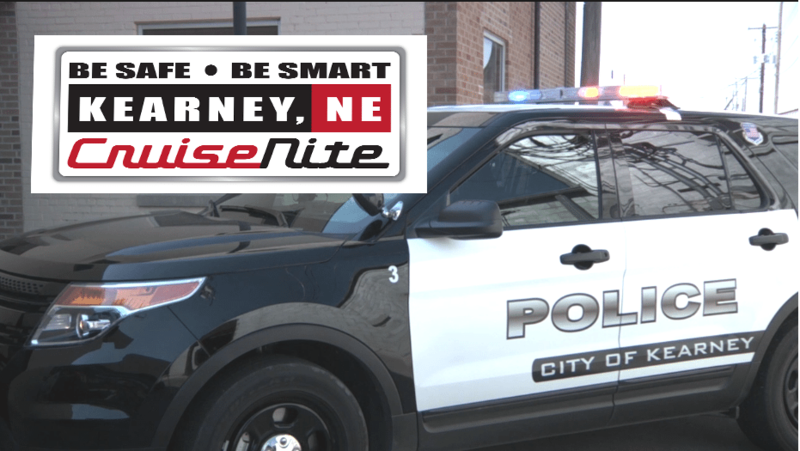 Kearney Police Department (KPD) saw a decrease in incidents around town during Cruise Nite celebrations compared to previous years. There were only 9 (MIP) minor in possession of alcohol charges. KPD received 222 calls for service from 6 p.m. Friday through 6 a.m. Sunday. That is 147 calls fewer than officers received last year during the event.The community has embraced the campaign and the task force continues to build a fun family event in our community.